Find places to stay in Del Mar, CA and other fun things to do. View our list of attractions, activities, events, restaurants and visitor information. Currently as low as $327.04/night! Located 23 km from University of San Diego and 23 km SeaWorld San Diego in San Diego #1943 - Sweet Spot II Three-Bedroom Holiday Home offers accommodation with a kitchen. This property offers access to free WiFi.The holiday home is equipped with a satellite TV. Currently as low as $262.58/night! #1945 - Sweet Spot I Three-Bedroom Holiday Home offers accommodation in San Diego 23 km from University of San Diego and 23 km from SeaWorld San Diego. Currently as low as $652.72/night! #230 - Del Mar Beach Beauty Three-Bedroom Holiday Home is located in San Diego. The University of San Diego is within 22 km of the holiday home and free WiFi is provided. #2364 - Del Mar Delight Two-Bedroom Holiday Home is located in San Diego 19 km from University of San Diego 20 km from SeaWorld San Diego as well as 21 km from Old Town San Diego State Historic Park. The accommodation is 25 km from Balboa Park. Currently as low as $159.99/night! Just one block from the beach sits the non-smoking Best Western Premier Del Mar where our guests enjoy such amenities as high-speed internet access as well as an outdoor pool and gardens. The Best Western Premier houses non-smoking 80 rooms on three floors. Free Internet, Swimming Pool,Outdoor Pool, Restaurant, Non Smoking Rooms. The name says it all for our guests looking to stay as close to the beach as possible. The Del Mar Motel on the Beach offers that and more like a beachfront sundeck an outdoor shower and ocean views. Free Internet, Non Smoking Rooms. Currently as low as $107.25/night! Just across the street from the Del Mar Fairgrounds and the Del Mar Racetrack is the Hilton San Diego/Del Mar where our guests enjoy complimentary local shuttle service an outdoor pool and on-site dining. Swimming Pool,Outdoor Pool, Pets Allowed, Non Smoking Rooms. The contemporary Hotel Indigo San Diego Del Mar welcomes our guests with ocean views free Wi-Fi two pools and a day spa among its many highlights. The two-story hotel offers free Wi-Fi mini-fridges microwaves coffeemakers and hairdryers in all 94 non-smoking rooms. Free Internet,Outdoor Pool, Restaurant, Pets Allowed, Non Smoking Rooms. The luxurious and non-smoking L'auberge Del Mar overlooks the Pacific Ocean and features a private footpath to the beach and our guests who stay there enjoy on-site dining private poolside cabanas and on-site tennis lessons. Swimming Pool,Outdoor Pool, Restaurant, Pets Allowed, Non Smoking Rooms. Currently as low as $132.00/night! 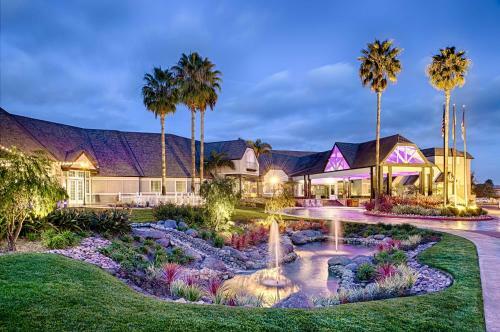 A 15-minute walk to Del Mar City Beach this California boutique hotel features a courtyard complete with an outdoor fireplace. Offering ocean and garden views all guest rooms include free Wi-Fi. Free Internet, Pets Allowed, Non Smoking Rooms. Offering individually decorated rooms with balconies with Pacific Ocean views this quaint Del Mar B&B is 8 minutes' drive from Torrey Pines Golf Course. It features a picturesque courtyard and serves a full daily breakfast. Free Internet, Non Smoking Rooms. Currently as low as $187.50/night! Resort life includes two outdoor pools and ocean-view apartments with free Wi-Fi and full kitchens at the Villa l'Auberge in Del Mar. Free Internet,Outdoor Pool, Restaurant.